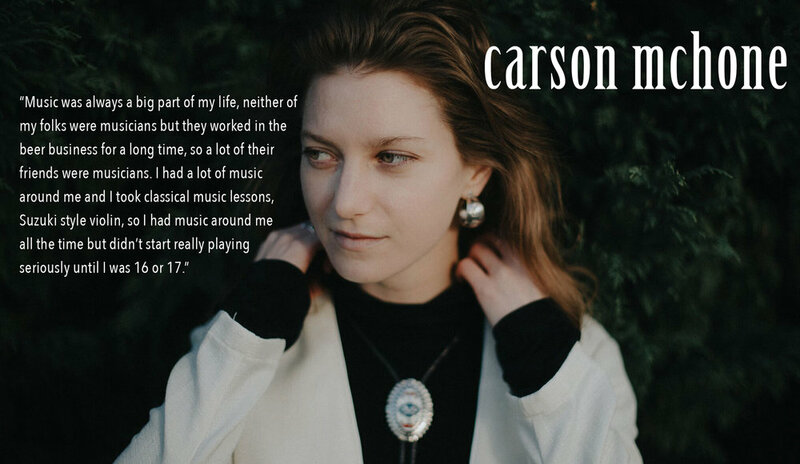 Playing residencies in Austin’s legendary venues like The Hole In The Wall and The White Horse as a teenager provided the ideal grounding for Carson Mc Hone’s career as both a writer and performer. Two- and three-hour Happy Hour sets and late-night shows to a variety of drinkers, listeners, barflies and dancers were both an education for her, keeping the music and beer taps flowing and also the memory bank ammunition for writing material from the experiences and encounters. Mc Hones’ first U.K. Festival showcase was at Americana Fest at Hackney in London recently, where she played a solo set to a large and attentive crowd. Lonesome Highwaymet with the self-assured and engaging young Texan, to learn about her career to date as she prepares to further establish herself in the European market. Were you writing before you considered putting music to your compositions? I was, my mother’s a writer, writing mostly short fiction and poetry. I grew up in a house where every surface became a bookshelf. I read a lot as a kid and was writing from a young age. The schools I went to had great literary teachers and there were certain classes offered. I was able to take a poetry class when I was in seventh grade. I started writing what you could call poetry and prose when I was much younger and didn’t get a guitar until I was about sixteen or seventeen. That’s when I started putting the two together and started writing songs. I’ve always kept a journal and I’ve always loved to read and write, which got me into playing. Music was always a big part of my life, neither of my folks were musicians but they worked in the beer business for a long time, so a lot of their friends were musicians. I had a lot of music around me and I took classical music lessons, Suzuki style violin, so I had music around me all the time but didn’t start really playing seriously until I was 16 or 17. What music would have been around you at that time in Texas? Well, Townes Van Zandt and Guy Clark are Texas legends, especially in Austin. My dad was really into bluegrass, so there was Ralph Stanley, Allison Krauss, Patty Griffin, Lucinda Williams and some more modern stuff. My folks are big fans of Dylan and Cohen, so from a young age I knew who those people were. I started reading their lyrics, really coming at their music from a more lyrical side. You weren’t listening to the Rock and Indie artists your peers were likely to tune in to? Not really, I probably lived under a rock! I wasn’t exposed to the normal rock and roll teenager stuff, gravitating towards the folk stuff that my parents liked. You’ve obviously had tremendous support from your parents and been heavily influenced by them rather than a rebellious teenager? Absolutely, it meant the world to me to have supportive family, I’m sure it keeps them on edge sometimes (laughs). When I left high school, I wasn’t interested in going to college, but didn’t have a plan otherwise. I thought I’d go and do the music thing until I had another plan. When I decided it was what I wanted to do, I came home from school and immediately got a regular gig and started putting a band together for the first time. My folks were fully supportive, they’re both very close to the music business. Having a vineyard and a bar brings you close to that musical environment. The early gigs involved playing residencies at 16 or 17 years old. Was that solo or with a band? Solo at first and gradually I made friends who would come and sing with me, but for the first few years it was always solo. When I came back from school there were venues I wanted to play but was told ‘‘you need a band, this is a honky tonk not a songwriter room’’. That was good for me because if I wanted to play there, I had to put a band together. So, I just grabbed a group of people that I knew from playing around and the band tended to be different people, depending on who was available. So, that became my first time playing with a band at 18 years old. A good learning experiences playing with a band to talkers, drinkers, barfly’s and listeners? Yes, that’s the community that’s going to support you at that stage of your career, if you’re to survive. I always wanted to also surround myself with musicians that were better than me, it’s good to know what you’re up against from an early age, playing with and to all sorts. Playing covers or your own material at that stage? Half and half, obscure covers by the likes of Patty Griffin that nobody probably heard before and probably thought were my own songs! I was writing quite a bit then and its funny to look back on those gigs now and wonder how I filled up three hours of playing. What songs was I playing? Probably a lot of my own songs that I’ve forgotten! How can you possibly remember all the lyrics playing for three hours? Sometimes it’s just muscle memory. Though its funny, if I’m teaching someone a song and I need to start at the bridge again, I’m like ‘’no I need to start at the top again, I can’t remember where I was’’! You brought producer Mike Mc Carthy on board for your recent album Carousel. He’d worked with Patty Griffin, who you mentioned earlier, had that a bearing in your decision to work with him? Mike lived in Austin, he raised his daughters there, living there for twenty something years. He’d heard my name and a mutual friend introduced us. I went in to his little studio when it was still in Austin to do some demos. He wasn’t really producing but engineering, so he took a backseat without saying anything, it was like we were sounding each other out. So, he came back to me later and said ‘’come in and record every song that you’ve written, I want to hear them, bare bones, guitar and vocals only’’. So, over the next year we chatted about making a record together, how we’d approach it and decided to just go for it. In that time, he had moved from Austin to Nashville where he’s doing more work up there, in Quad Studios on Music Row, it’s now owned by a publishing company. What do you think Mike brought to those songs that you have previously recorded on other albums? He managed to separate your vocal from the music to the extent that they don’t interfere with each other yet work particularly well in parallel? That comes from people either having an innate sense for the songs or not. He engineered the record as well, works with great gear and knows how to capture the sound and make the vocal shine through in a way that it’s not buried. We were also working in a real studio. It was all really new to me, when I’d recorded before it was in people’s houses, even if they had full blown studios in their houses, this was kind of different and certainly next level. He didn’t want me to change the way I’d been singing them, he just wanted to push everything else into a new light to cradle my vocal. In a hugely crowded workspace, he’s given you your own identity. I listen to the album and its very much Carson Mc Hone. Its hard to capture that but he has managed to? That was the exact goal. A number of younger artists, like yourself, are addressing mental illness in their writing, rather than bottle up the inevitable career hurdles such as rejection, uncertainty and insecurity. The track Sadfrom the album is just one example? I think so and I’ve said this before, talking about that song in particular. You need to recognise that in yourself and in other people and respect that. If you look at it as a bad thing and push it to one side and shame it, you’re not addressing it. It will screw you up but equally if you dig into it too much and let it take over, it can also destroy your life and do terrible things. There’s a really fine balance that needs to be met. Sadmay not be completely admitting that, but it’s a good start. And it takes a bit of pride to write like that also, the reason I wrote that song was that someone was giving me a hard time about writing sad songs, saying I was just wallowing and making myself miserable. I was ‘‘No, this is what I need to do to be ok with myself’’. There is an attitude about it, but if you can recognise those things in yourself that make you melancholy, it’s a thing to nurture to a certain extent, as it leads to you to empathy and allows you to recognise it in other people. Drugs is also an interesting song on the album? So, that song, its actually sort of a co-write. A friend of mine wrote a version of Drugs, the original version. I had never really co-written with anybody, I still really haven’t. I heard that song in Germany on tour with a group of songwriters on a project called the ATX6, where six Austin songwriters from all different types of genres are brought to International Music Festivals. One of the artists couldn’t go that year and my friend Chris Brecht, who organises the whole thing, he’s also a songwriter, sat in and he played a song called I Need Drugs. He just sang that incessive chorus, ”I Need Drugs, I Need Drugs, I Need Drugs” over and over and I thought that it sounded great. But I didn’t want to just cover the song, as there were lines in it that just didn’t feel like me. So, I ended up getting really drunk one night and leaving him a long voice message asking him if he minded me going in and re-writing the song! If someone asked that from me, I’d probably go ‘NO’, but he encouraged me to sing it and change whatever I wanted. His song was originally about being in a bad relationship and doing drugs. Instead, I just concentrated on the metaphor I guess, and wrote about misuse or abuse of another person and how that can be like a drug. I’m so grateful for him for letting me do it as it became a really fun exercise because it allowed me to totally rip stuff out of myself and put it in there. It didn’t have to be true to this narrative, which gave me great freedom instead of having to tell a story about this thing that actually happened to me. Instead allowing me to put bits and pieces of things into a song that already had a skeleton. Your writing is very personal and confessional. Does that exclude you co-writing going forward? I just haven’t really done much or any of it, though I’m sure I will be going forward. I think it’s a really healthy exercise for learning different turns of phrases, ways to structure a song and also bouncing ideas off someone else has to help in writing clever songs. Recently I did start a co-write with a friend of mine which we haven’t finished yet. He sent me a chorus that had this phrase that he wanted to write about. I thought what if we turn it on its head, still using this line and he thought great let’s do it, so that was fun and something I probably need to do more of. You appear to be as well suited to Loose (Record Label) as the label is to yourself. How did that marriage come to be? I’ve never signed a record deal before and they have been so kind and supportive. New territory for me and they’re such lovely people, putting us up and looking after us. My manager Tim knew of Loose and I had done some tours with Joe Pug, who mentioned them to me, because he knew I was going to be in Nashville last year for Americana Fest. Meeting Tom (Bridgewater) and Julia (Grant) and hanging out with them was what did it, putting faces to the names. We chatted and the rest is history, they seem like family now! You obviously perceive Europe a target market for your music? I think so, I know people in the States and in particular Texas, that have bigger careers in Europe than at home and Europe seems hungrier for the Roots and Americana stuff. Chris Brecht, that I mentioned earlier and heads up the ATX6 project, had us playing Germany four years ago. People seemed to appear out of the woodwork, coming to shows with photographs of me to be signed. I was wondering ‘’ how they even know who I am, or where did they hear my music’’. People knew my songs and it felt really good so I feel really lucky that the Loose label can facilitate me. The persistent lack of radio plays in the States must be irritating for you as an emerging female artist? I don’t know how the deal with that. With the exception of the smaller independent radio stations, much of what gets played is lacking in soul. I’m thinking ‘’why bother waste money on trying to get airplay’’. I’d rather just go and play shows where I can go and shake someone’s hand and speak with them face to face. The major radio stations seem to be saying ‘’we’ve already played a woman in the past hour’’. It’s so bizarre! You currently touring solo in the U.K. Are you comfortable with that or prefer the company of a band on the road and on stage? I love having a band but I probably need to work solo tours for a while before I can afford to bring my band over. I love playing with a band, it can be fun and doesn’t always have to be a rock show, it can be very delicate too. Solo’s good too and It was really cool that so many people came to see me last night. Where do you see yourself career wise five years down the road? Oh man! I should have an idea, because I think that’s healthy. I hope to have a couple more records under my belt. I love being on the road and when I’m not touring, I just love quiet space to write, so I’d be happy to be still doing that and being able to afford to do that. I’ve made some big moves in the past year but don’t have any money (laughs). I don’t mean for it to sound desperate but I want to keep challenging myself, playing interesting shows and writing music that excites me.